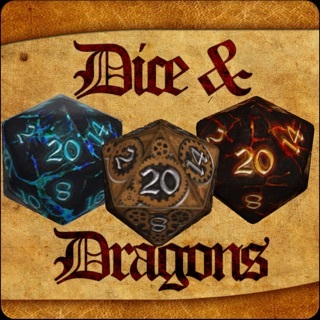 This app is built for the Pathfinder Role Playing Game to track your spells per day, help you prepare spells, and help you cast spells. It's an essential companion for players and GMs to track characters and NPCs as they cast and prepare spells from their character sheet. Spell Tracker uses your Pathfinder character sheet to automatically calculate how many spells per day you get. 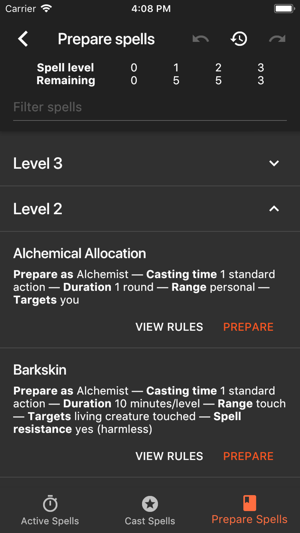 It shows you the targets, areas, ranges, casting time, duration and components for each spell, and even provides a link directly to the rules. When you cast spells, they are all tracked in one place. 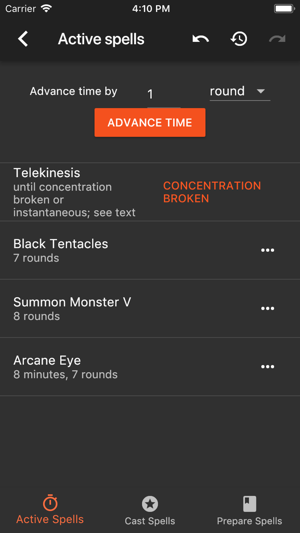 As you spend time casting and preparing more spells, the app automatically tracks how long is left from active spells you cast earlier. No need to use a pen and paper or spreadsheet to track your daily spell usage, or to flip through your character sheet to find the right spell to cast, or to look up spell rules. 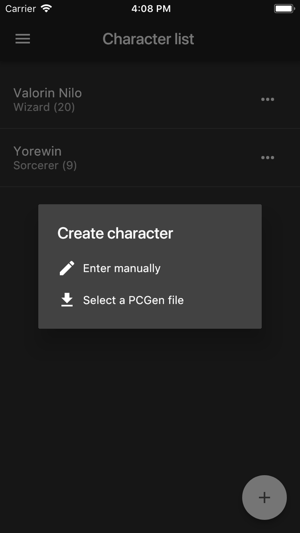 Simply add your character from a PCGen file (.pcg) or by using the simple character builder, then instantly get access to your character as you prepare, cast, and track the remaining duration of ongoing spells. Lookup the spell in the Pathfinder Role Playing Game Standard Reference Document at the touch of a button if you need more detail. See the spells you know, have prepared, and have cast - all in one place. 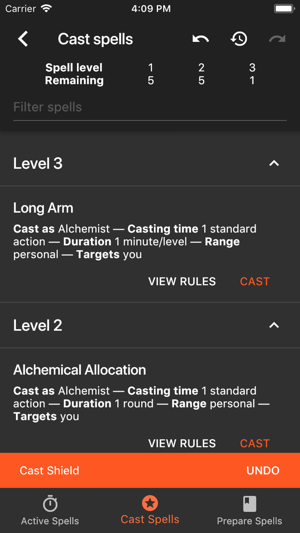 See the saving throw, targets, and range without even checking your character sheet. You can even use metamagic! Save time, feel awesome. Spell Tracker supports classes from the Core Rulebook, Advanced Players Guide and Ultimate Magic including Wizard, Sorcerer, Cleric, Magus, Ranger, Paladin, Oracle, Inquisitor, Druid, Alchemist, Summoner, Witch, Antipaladin, Bloodrager, Shaman, Arcanist, Bloodrager, Shaman, Hunter, Investigator, Skald and Warpriest. Spell Tracker supports awesome Occult classes Mesmerist, Psychic, Medium, Spiritualist, Occultist. It includes all spells from PFRPG Core, APG, Ultimate Combat, Ultimate Magic, and many more. Over 2000 spells from over 130 sources! - Multi-class characters now show remaining slots per class. - The character editor now shows spell overviews. - Wizards are now warned when preparing spells from opposition schools. 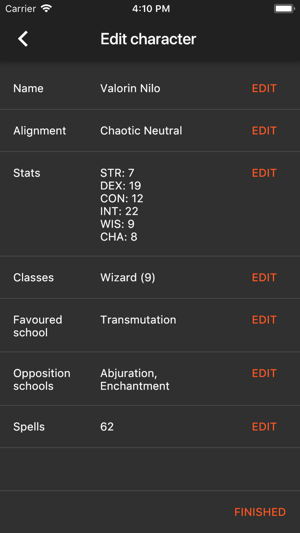 - Spell school is now shown in spell overviews. - Spell database has been updated. - Users can now create new Spell Loadouts. - Wizards no longer learn cantrips from opposition schools. - Shamans had extra spontaneous spells removed. - Mediums received various improvements. Overall, I really enjoy this app and it’s functionality is wonderful. The group I play in runs our games mostly all digital so this is a fantastic addition. I’m glad being the only Apple user I can now use this app. There is only one issue I have encounter so far that hinders my usage. It does not seem that the app allows for editing the number of slots available to prepare spells. Playing an Arcanist, I have taken a feat that allows me to prepare one extra spell the highest level I can cast. The app currently limits preparation to what the class is allotted without feat consideration. Only fix I see, overall fantastic and useful tool for all spell casters. Thanks for the review! The option to add extra spell slots (or customize spell slots for magic items and class specializations) is a great idea. I plan to add it to a future version of the app. If you have any other feedback, feel free to email me anytime at ben@casterlevel.com! This is exactly the app I’ve been searching and hoping for. Really the only things I’d change are adding the option to add custom spells and track more things (which I know are currently in development). Other than that it’d be cool if we could choose to pull the spell descriptions from from Archives of Nethys, but this isn’t in any way a dealbreaker for me. 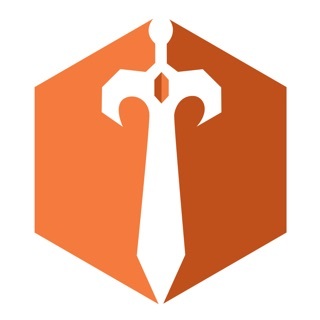 Great App and keeps getting better! The works as advertised. My GM appreciates it, because I actually use the right amount of spell slots!